Have you ever heard people get in a shouting match about which football team or player is the best? Or maybe you’ve gotten into it with someone about politics, healthcare, standardized testing, gun control.… Some topics lend themselves to heated debates. What do you do when you believe one thing, your friend, spouse, co-worker or family member believes something completely to the contrary… and neither of you are willing to budge in your beliefs? Sure, you can call it quits and vow never to speak to the person again. But if you do that very often, you’ll end up completely alienating yourself and ruining any chance you have of making a positive impact in other people’s lives. If the relationship is important to you, perhaps a better route is to agree to disagree. This is hard for me. I believe what I believe because I think it’s right and true. So it bothers me when people disagree or don’t see things my way—especially if it’s something I’m passionate about. But if I turn that line of thinking around, it stands to reason that when I challenge someone’s beliefs or ask them to consider something that seems totally outrageous (like a Saviour who welcomes all but requires a faith that’s exclusive to Him), they won’t necessarily like it. If we approach life from a Christian worldview, we can’t expect people to readily agree with us. Neither can we condemn seekers for living worldly lives. (1 Corinthians 5:12) How else would they live?! The world is their reference point. Instead of judging people or belittling their perspective, share the joy, peace and/or comfort you’ve found in Christ. Ask if you may share another viewpoint or something you’ve learned or experienced (aka, your story). Show them the scriptures that helped you find your joy, peace, and purpose. 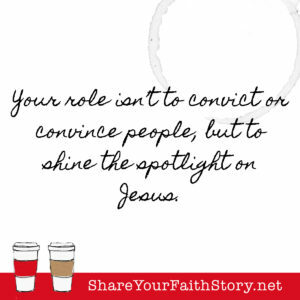 Remember, it isn’t your role to convict or convince people, but to shine the spotlight on Jesus. And if they aren’t interested in budging in their line of thought, be okay with agreeing to disagree. Be kind. Love them anyway and use your words and actions to show them your Hope within.